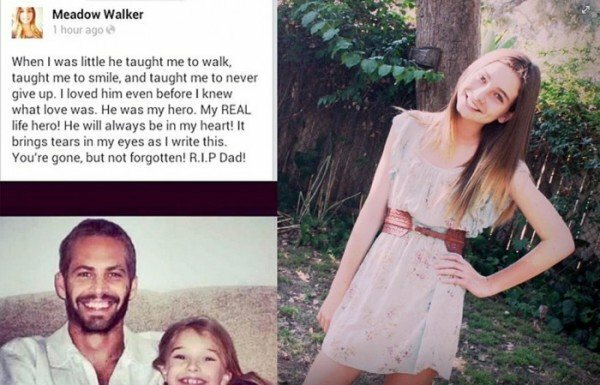 Paul Walker’s daughter, Meadow, has launched a foundation in the Fast and Furious actor’s memory to mark his birthday on September 12. Meadow Walker, 16, tweeted that she wanted to start the Paul Walker Foundation to “share a piece of my father with the world”. The foundation’s mission statement is “Do Good”, reflecting his passions for the ocean, for helping people and animals and “spontaneous goodwill”. Paul Walker died in a car crash in 2013. He was killed by impact and a fire in the crash in California. Paul Walker, who was 40 when he died, was a passenger in the Porsche that a friend was driving when it hit a pole and burst into flames. The foundation is aimed at “empowering future generations by providing grants, scholarship opportunities and spontaneous acts of goodwill”. Paul Walker was also known for making documentaries about sharks with the National Geographic Channel, having studied marine biology before becoming an actor. The actor’s death prompted a huge outpouring of tributes from fans and people who had worked with him, including his Fast and Furious co-star Vin Diesel, who went on to name his daughter Pauline in honor of his friend. The posthumous release of Paul Walker’s Furious 7 took $384 million at the global box office in its opening weekend.